The date was Wednesday, March 8, 2017, and it was a blustery and bleak day. It contained fierce winds and dreadful temperatures that we all felt and complained about as we wrapped our outerwear closer to our bodies and walked leaning against the wind. While we were working in the office the lights flickered throughout the room and the internet exited from my laptop several times. After tackling a weary and challenging afternoon I was not elated to hear the news that fell upon my ears when my cell phone rang. The Hubby was on the other line and dreadfully announced to my tired spirit, “We lost power.” Various thoughts approached me, even though I tried to turn them away with all of my remaining reserves of strength. How would I charge my phone? Oh, no I won’t be able to purchase ice cream? How will my family and I stay warm? What about the food in my fridge? Does this mean I will be attacked with another crippling winter cold? What about posting on Facebook and Instagram and checking all the statuses in the news feed? Were there enough batteries, flashlights, and candles in the home? The list of worries was getting longer and my heart began to ache. Once the evening began to settle I found myself faced with yet another challenge. I wasn’t feeling well at all, due to other health matters which lead me to Henry Ford Hospital Emergency room, where I spent over six hours waiting for treatment. However, that’s another story. The next four days would be a test of trials and errors. The first morning of lost power saluted me with warm sunshine from my bedroom window, but the coldness greeted me with a bitter attitude. The Hubby lit the stove with a lighter in order to cook breakfast. The days took a toll on our budget as we purchased ready-to-go meals from nearby restaurants. Countless lessons were learned during this ordeal of dealing with the cold and darkness within my home without the benefits of heat and electricity. One of the most important lessons that held on to me like an unwanted magnet was to “Practice Patience.” From time to time I sat in someone’s car to charge my phone. 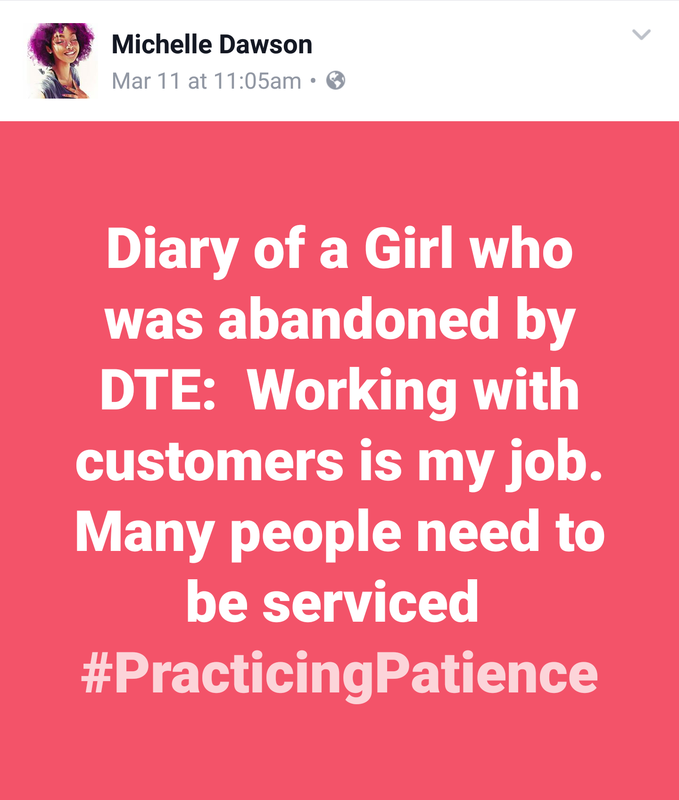 I posted several rants on Facebook about how I was the Girl with a Diary and the Detroit Edison Company (DTE) abandoned me. Every time I heard the sound of a heavy truck I slowly walked to the window and peaked to hopefully view the sight of a DTE truck. I was hoping the utility company finally sent a rescue team to deliver this household from their loss of heat and other electric woes. However, I was wrong and disappointed more than once, because each time it was another truck driving down the street playing with my last thread of sanity. I was a displeased customer. At some point, I had to realize that this whole experience was a true awakening. Four days without heat and electric services wasn’t an elaborate event by most standards, but it was an enlightening experience. The opportunity allowed me to view how I perceived myself at times and how I critiqued others in this society: self-centered. Many overcrowded hotels took advantage of this opportunity by raising hotel rates. Our block was the only victims on the entire street to lose power, while our neighbors enjoyed the warmth and light from their homes. It made me recognize how I advocate for my community, but ironically I don’t have a relationship with my own neighborhood. Not one individual knocked on the door and offered a loaf of bread, candle, a charged flashlight or a bowl of ice cream. During this moment I truly understood the meaning of Proverbs 18:24: “A man that that hath friends must show himself friendly; and there is a friend that sticketh closer than a brother.” It showed me I have work to do. I know there were thousands who faced trying times without power for over three days. Personally, it was a chance for me to recognize the value of practicing patience, giving gratitude, and expressing empathy is needed not only during times of a crisis, but each day of our lives. Other Suggestions from the Hubby when dealing with future power outages. You can google the products listed below. Chellyz you are so perceptive and wise; when’s the book coming?